One of my new years resolutions was to try and be more organised; 'Try' being the main word here, as normally I am terrible at organisation. However I had a plan that would make me actually want to sort everything... Filofax! Now for any of you that don't know what a Filofax is, it's a ring bound personal organiser that allows you to personalise how you use it; Whether that be as a diary, address book, appointments and notes or all of the above. 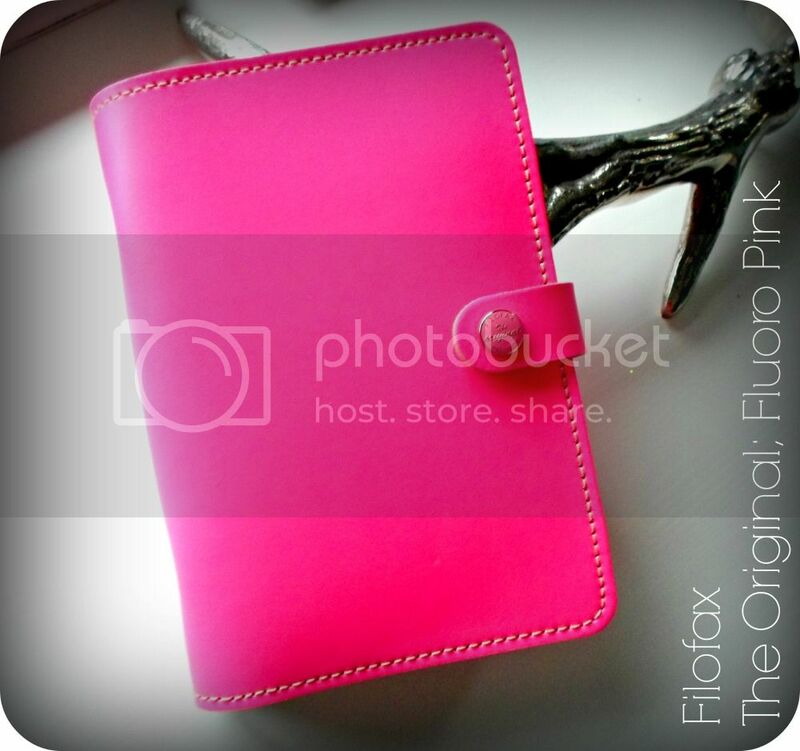 As of lately Filofax have been bringing out newer models of organisers that are a lot more fashion foward and definitely aimed towards a youthful audience, which I guess is us.. Right? This here is my Filofax that I was lucky enough to receive (big thanks to Jess for that! ), it's one of their latest designs, The Original personal in the totally gorgeous fluoro pink colour. I tried to photograph the colour as best as I could, but a camera just can't seem to pink up the beauty of this colour (and it is definitely a lot more neon than it looks). So if you're not into bright colours, then this one way not be for you, but The Original does come in a huge amount of amazing colours. As I was so excited to start using this beauty, I definitely got a lot more excited about organising (that was my goal, so yay!). I created my own front cover and dividers in photoshop, using images I found online that I loved, just to add a little more fun and make it a little more personalised. There's also a great little jot pad slotted in the back, which is perfect for all the lists I write! I am an obsessive list writer, I just can't seem to stop.. I've looked through many of the different style available on the Filofax website, and I must say, The Original is definitely one of my favourites. Not only do they come in a range of fashionable colours (and a patent finish if you prefer that). But the overall look is just flawless. Made from real leather, this is great quality and lovely and soft. With exposed rivets and a cute button on the fastening this is definitely one of the most fashionable Filofaxs around. So if your New Year's resolution is to get more organised, plan things out more, or even if you just fancy trying one out, then head on over to the Filofax website and maybe have a look around!